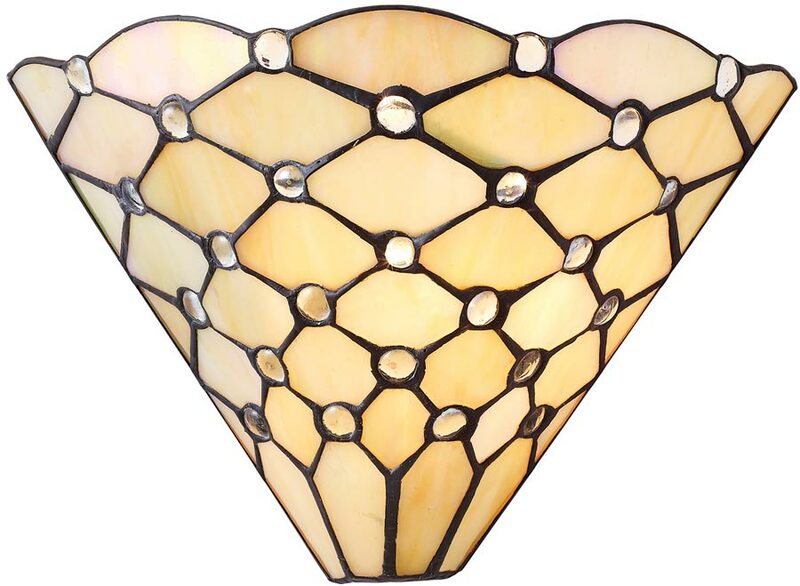 The Pearl, flush, iridescent 1 lamp traditional Tiffany wall light features a simple classic geometric design, with a wonderful mother of pearl finish and clear glass jewels that will sparkle when illuminated. An elegant and simple Tiffany shade with that extra iridescent finish other lamps lack, supplied with concealed flush to the wall mount. This is a hand-crafted Tiffany shade wall lamp and the colours may differ slightly from the image shown, as each piece of glass is hand-made and may differ slightly in colour or shade. This should not be seen as a fault, rather something that makes each Tiffany shade unique. The Pearl, flush, iridescent 1 lamp traditional Tiffany wall light, designed and manufactured by Interiors 1900.